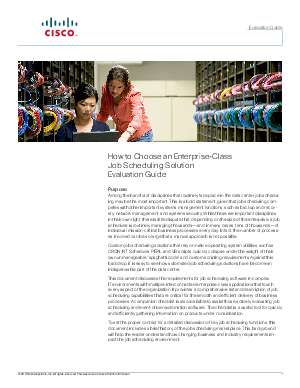 This document discusses the requirements for job scheduling software in complex IT environments with multiple interconnected enterprise-class applications. It provides a comprehensive list and description of job scheduling capabilities that are critical for the smooth and efficient delivery of business processes. This updated version of the Enterprise Job Scheduling Evaluation Guide is a great tool for those actively comparing workload automation and job scheduling solutions. It includes information on what you should look for as well as what impact each capability has so you can evaluate its importance in your own environment. Key capabilities discussed in detail include: - Business calendaring capabilities - Dependency management and event-driven processing capabilities - Graphical management and ease-of-use - Auditing, reporting and alerting capabilities - Queues, Load balancing, and resource management - Enterprise Coverage: Range of platforms supported, applications supported, database support, FTP/SFTP/FTPS support - Architectural considerations including scalability, fault-tolerance, APIs, security, integration, etc.